SIRIUS can be installed on all vehicles produced from 7/2003 - On without navigation and from 03/2004 - on with navigation Restrictions? 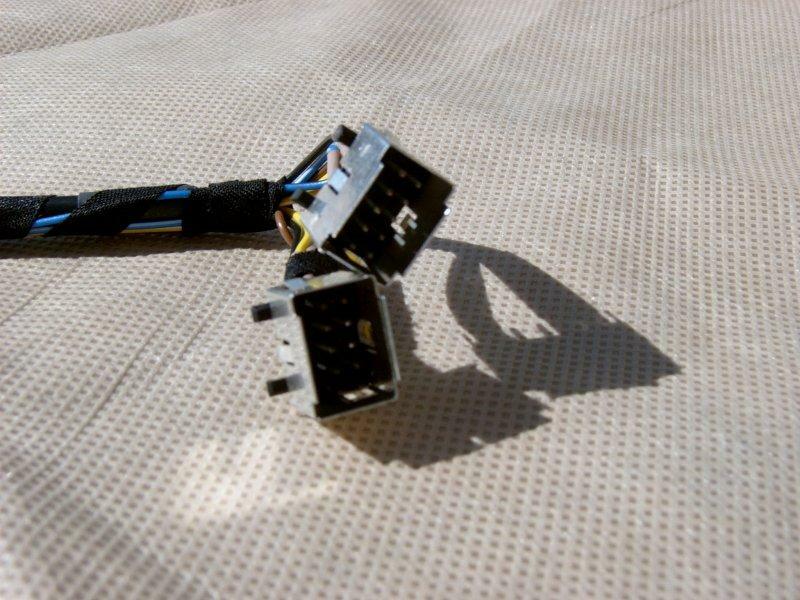 All X3's (e83) must have SA 693 (Satellite Radio Preparation) or satellite radio cannot be retrofitted in any way. 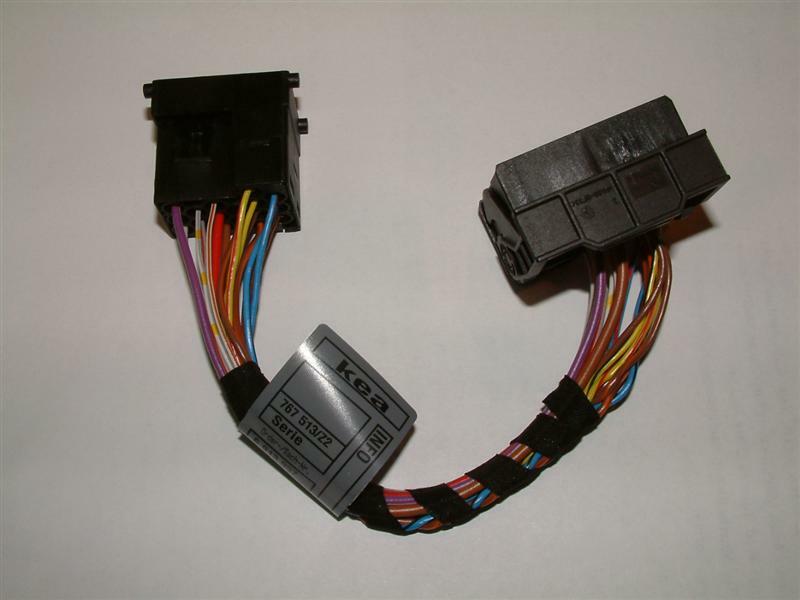 How to update your 2002 & 2003 X5, E46 3 series and E39 5 series BMW to support Sirius In the 2003 Model year MKIV Navigation equipped 3, 5 or X5 BMW by simply updating your Trunk mount radio with the newest version radio. The radio version required is the latest BM53 Radio. Upgrading your trunk mount radio to the latest version is as easy as unplugging the old radio and replacing with the new radio. The new radios are pin to pin compatible and take no technical skill. Simple unplug and replace with the new. 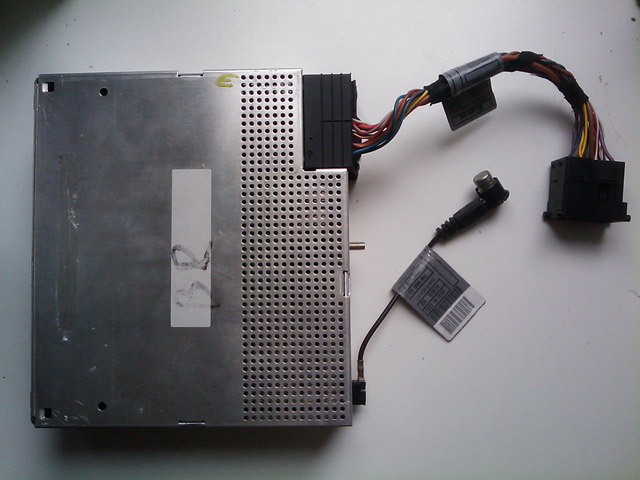 The location of the radio module depends on the model BMW with the E39 Radio located to the left of the CD changer. The E46 radio located below the CD changer, and the X5 located below plastic cover under the spare tire. Once the radio is replaced and your MKIV navigation software is upgraded to the latest version, your 2003 model BMW is Sirius Radio Compatible. Simple purchase the Sirius receiver & antenna and cable and Sirius will operate properly in your car. 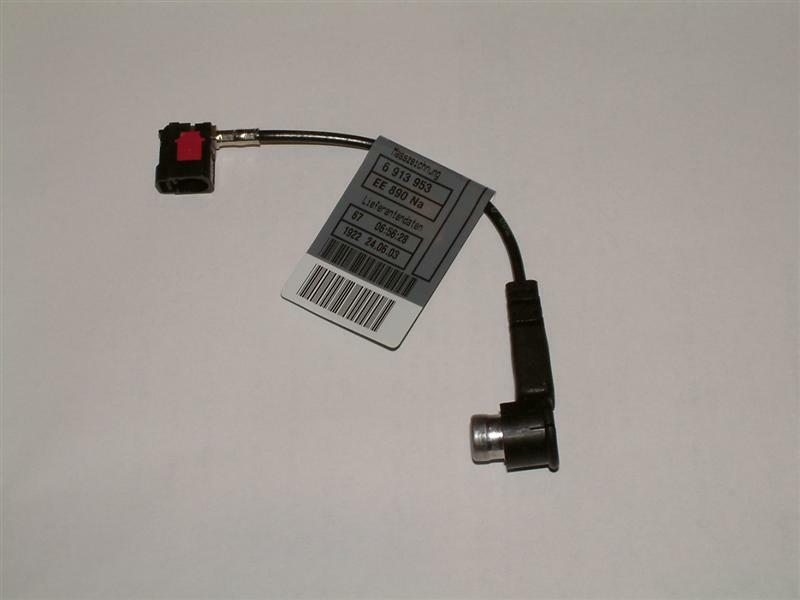 In the 2002 Model year MKIII Navigation equipped 3, 5 or X5 BMW, in addition to upgrading the Radio module to the latest version BM53 as above you will also need to upgrade the navigation computer to the latest MKIV version. 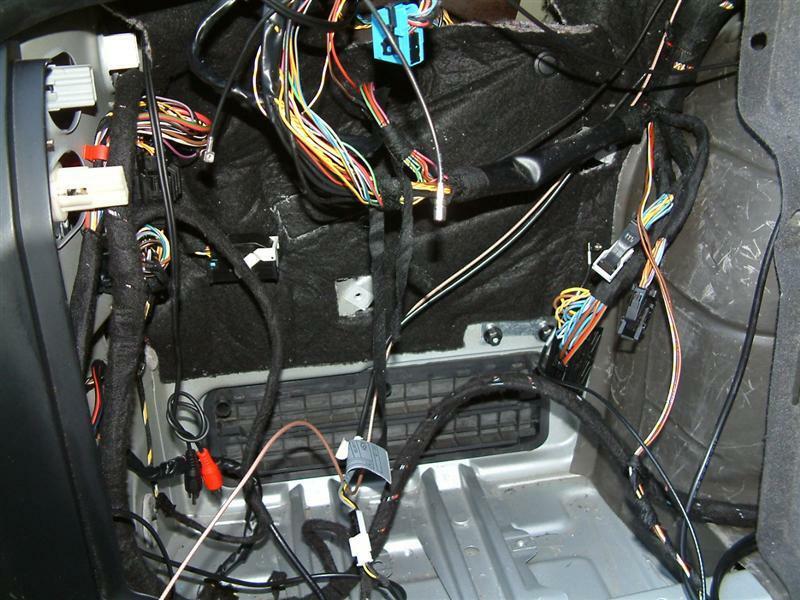 Replacing the Navigation computer is a simple task in the 2002 model year BMW. 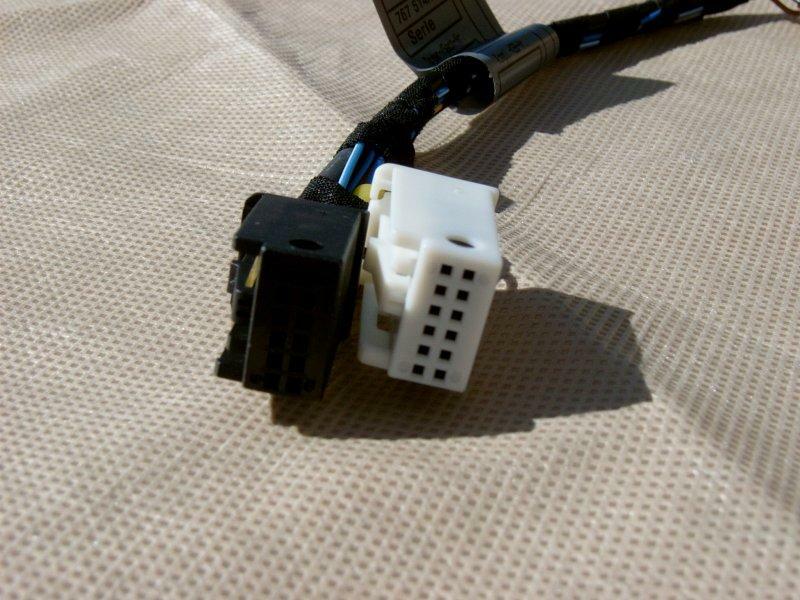 The BMW MKIV is Pin to Pin Compatible and is just a quick remove and replace. The MKIV navigation computer is REQUIRED when installing Sirius as the selecting of the channels is done via the navigation display. 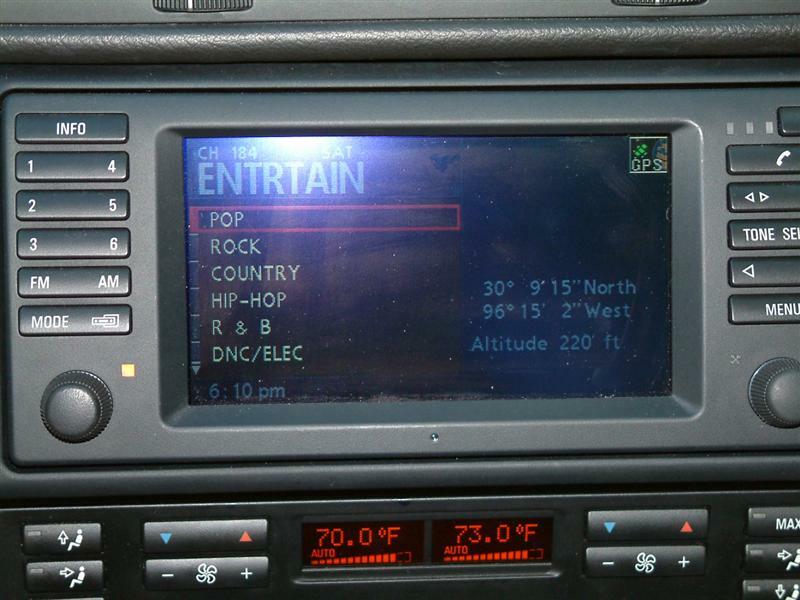 All of the functions of the navigation display are using the navigation computer. 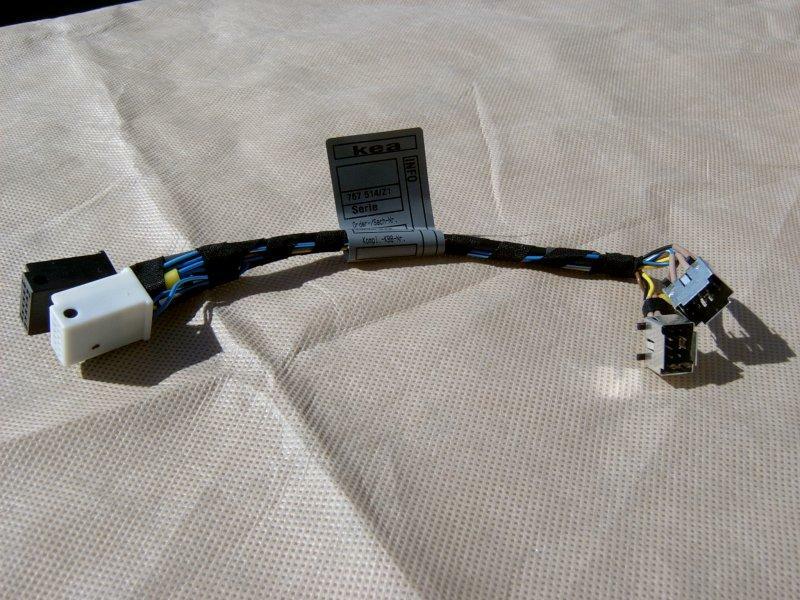 Radio Adapter Harness Kit consists of the following parts. 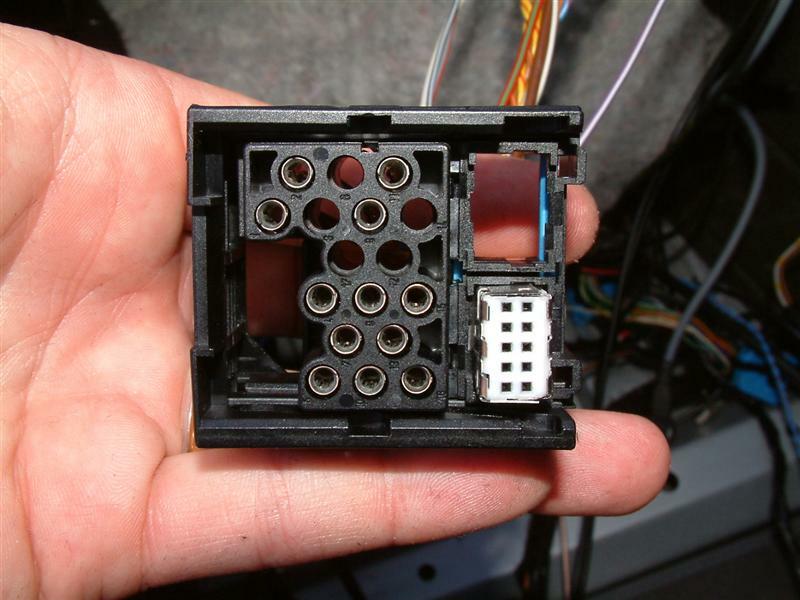 The BMW E39 Radio is located to the left of the CD changer. - Disconnect old radio, using adapter connect new radio module. Plug 6 pin audio plug into small radio plug location 3, 8, and 9 if equipped with DSP amp. Plug 6 pin audio plug directly into Sirius module. The E46 radio is located below the CD changer. 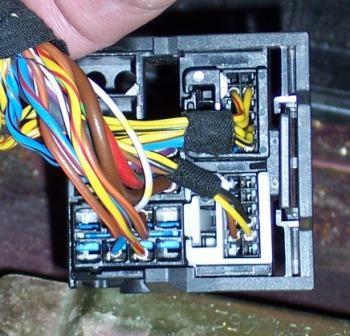 - Disconnect old radio, using adapter connect new radio module. 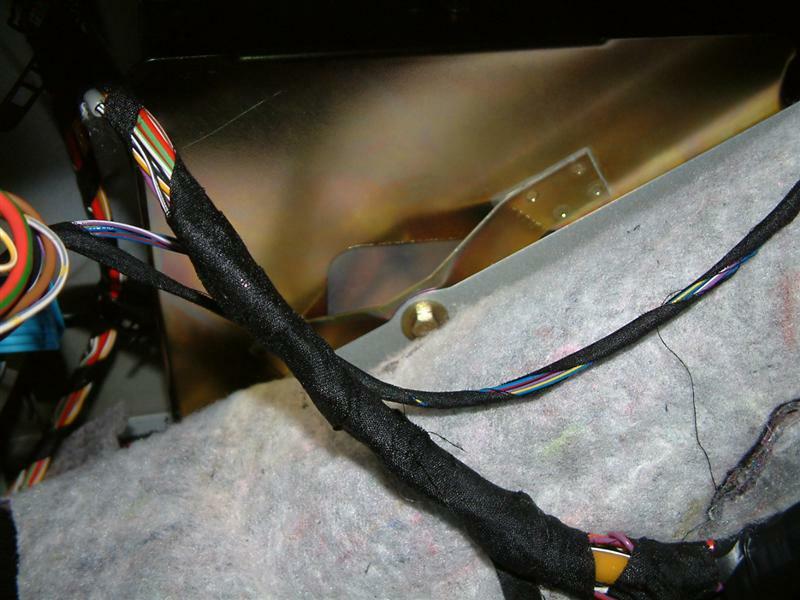 6 wire cd input cable is NOT required. The X5 is located below plastic cover under the spare tire. - Disconnect old radio, using adapter connect new radio module. Plug 6 pin audio plug into small radio plug location 3, 8, and 9 if equipped with DSP amp. Plug 6 pin audio plug directly into Sirius module. 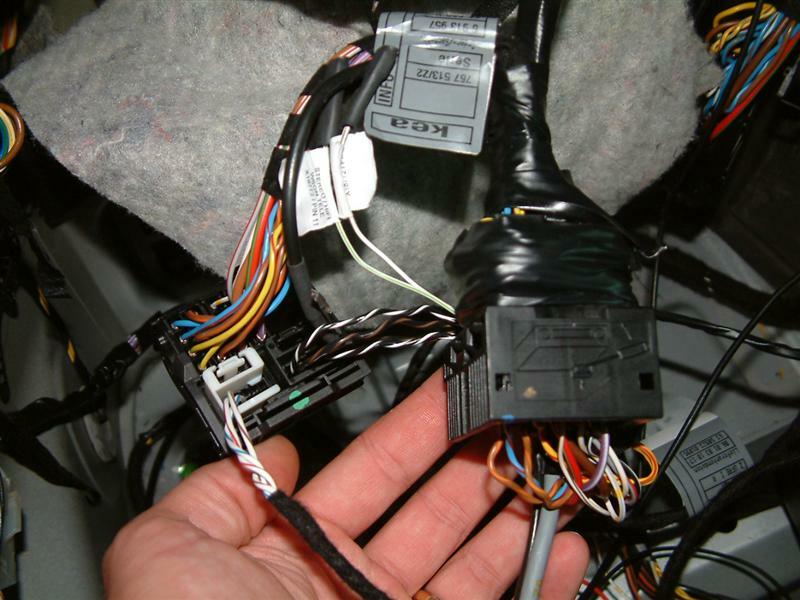 In the BMW E38 since the Radio is located behind the amplifier bracket the first step is to remove all of the components of the rear compartment to remove the old style radio Once all of the pieces are removed, you will need to remove the Trunk mount radio. 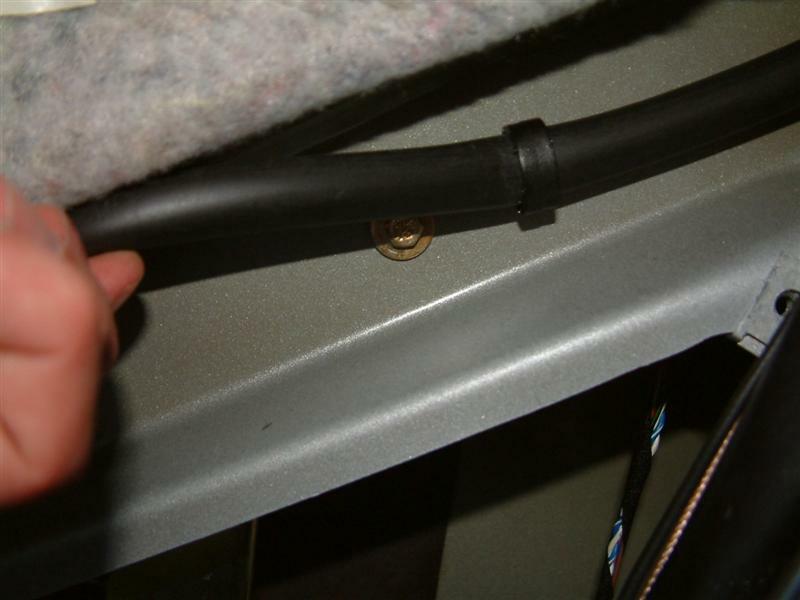 The radio bracket is held into place by two sheet metal screws. 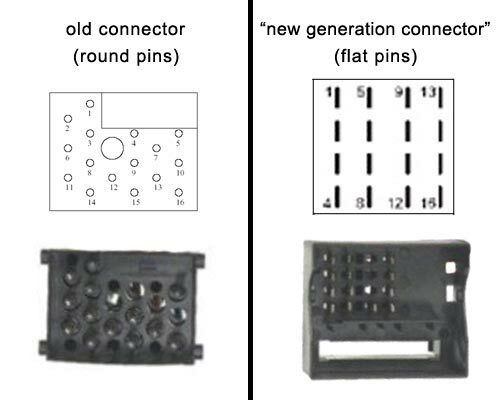 One is hiding on the left and the other is easy to see behind the black cloth Once removed, replace the old radio with new style radio and connect together with your adapter pieces. I wrapped everything in electrical tape just so that it did not rattle in the trunk area. Probably a good idea to wrap in cloth as well.